_Wannagoout? offers a variety of services to meet your needs and those of your dogs and your schedule. We book our weekday walks in 1 hour time frames with the help of Power PetSitter, our online scheduling system. If there’s a service you don’t see, give us a howl and we’ll do our best to make it happen. In choosing WGO?, your satisfaction and your dog’s happiness are guaranteed. 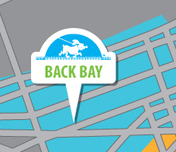 We currently service Boston's South End, Back Bay and Bay Village. Call today to set up a meet and greet! 40 minute group walk. . . . . . . . . . . . .
2 x 40 minute group walk. . . . . . . .
60 minute group walk. . . . . . . . . . . . .
2 x 60 minute group walk. . . . . . . . . .
Each additional dog . . . . . . . . . . . . . .
20 minute solo walk . . . . . . . . . . . .
2 x 20 minute solo walk . . . . . . . . .
30 minute solo walk . . . . . . . . . . . .
Each additional dog . . . . . . . . . . . .
1 visit . . . . . . . . . . . . . . . . . . . . . . . . .
2 or more visits . . . . . . . . . . . . . . . . . .
24 hour period. . . . . . . . . . . . . . . . . . . .
Each additional dog. . . . . . . . . . . . . . . .
Holiday or holiday weekend. . . . . . . . . .
Puppies 6 months and younger. . . . . . .
Weekend/holiday 30 minutes (10 am - 5 pm). . . . . . . . . . . . . . .
2 Weekend/holiday 30 minutes (10 am - 5 pm). . . . . . . . . . . . . . Weekday breakfast (8-10 am) 20 minutes. . . . . . . . . . . . . . . . .
Weekend/holiday breakfast (8-10 am) 20 minutes. . . . . . . . . . . Weekday 30 minute dinner walk (5-7 pm) . . . . . . . . . . . . . . . . .
Weekend/holiday 20 minute dinner walk (5-7 pm). . . . . . . . . . . Weekday 20 minute bedtime walk (8-10 pm). . . . . . . . . . . . . . .
Weekend/holiday 20 minute bedtime walk (8-10 pm). . . . . . . .
Lockout. . . . . . . . . . . . . . . . . . . . . . . . . . . . . . . . . . . . . . . . . . . .